If I could only begin to explain to you how cold it is in New York right now, I'd say imagine having constant brain freeze whilst dashing from show to show-It's murder, but it's totally worth it! In between meetings and showrooms we're wrapping up in layers of scarves, doubling up on knitwear and investing in copious amounts of thermals. Jesus it's cold. This look is super relaxed and SO me! These fur loafers are a god send, keeping my toes extra cosy, not to mention the glitter ankle socks. Socks and shoes are usually a big no in my books but I can't help but love the combination.. What do you think? 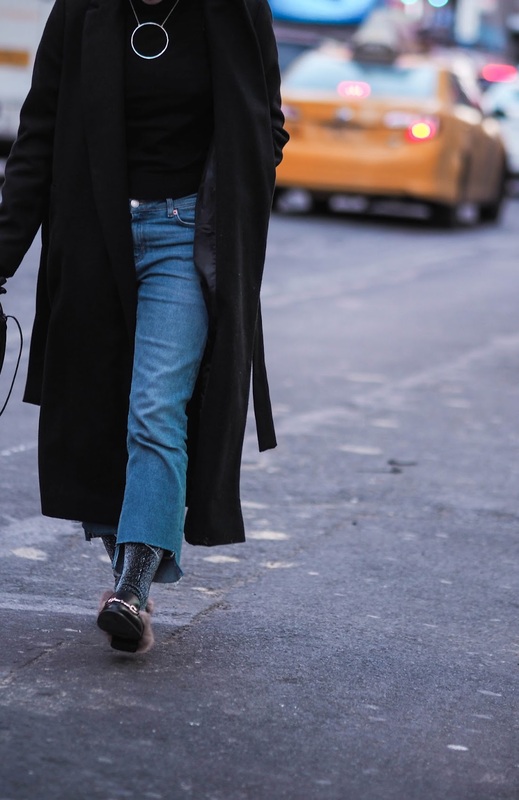 If you're looking for a pair of cropped jeans similar to the ones I'm wearing for the first day of Fashion Week, fret not, I've listed an almost identical pair below without the DIY job. (I hacked an old pair of cropped flares mid flight to reveal an exaggerated frayed hem!) Trust me, denim is big this season. I totally love this simple and chic look! Perfect combo! You seem to be a model in that black outfit. I recon your stay in New York for this fashion week is going to be most memorable days of your life. Isn't it? Craig Garside here a Wedding Photographer in Leeds. Nice pic & thanks for sharing it.